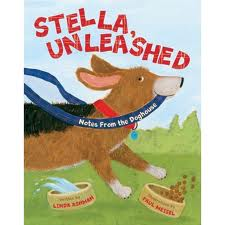 Summary: Stella, Unleashed was the first book we have read by Linda Ashman. One- to two-paged poems from the perspective of the dog, Stella, make up this book. From the picture on the cover, I expected a cutesy story appropriate for a toddler or preschooler. I would say, though, that this book would be better understood by late-preschoolers to early elementary children. The vocabulary stretched the understanding of my 4 year-old. Some concepts, such as pet adoption and pet grooming, were unfamiliar to her and led to extensive conversations (which, is great!) While a more tedious book to read than had I expected, it was fun over-all, making me want to find more books by this author in the future. Cons: A bit more mature than I had expected. A bit choppy as there are different poems in each page.